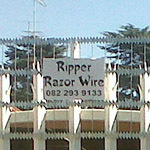 Specialists in the installation and supply of razor wire and spikes. Do installation to/on all walls, gates, fences, roofs, pre-cast walls and palisade protection (to avoid breaking and entering) and free-standing razor mesh fences. Razor wire is currently one of the best and most highly successful forms of security. Very cost effective and low maintenance. Not affected by power cuts or failures. We are a Benoni based company serving the Gauteng region for the past 17 years and providing commercial, industrial and residential property solutions in the security fencing industry. Our dedicated team offers you the top quality workmanship under full time supervision at the best prices. We only use ‘A’-grade materials and do not use inferior, cheap or reject materials. (Only Cochrane products) as we got a reputation to uphold. Please call us for an OBLIGATION FREE QUOTE to assess your security needs.